Pretty much at the same time, around the end of high school, my two favorite composers were Brahms and Bruckner. As you can see, one survived and made it to the subtitle of my blog. The other one, good old Anton, I listen too much less regularly these days. I still love mainly symphonies no. 4 and 7, but overall the broad romanticism and huge mountains of symphony blocks appeal less to me than they did at back then. Probably for similar reasons, I really still don’t appreciate Wagner that much, with some rare exceptions. In parallel my taste moved backwards in time from the late romantic area to really appreciating Mozart and Bach. When I was really young I thought of Mozart as “too light”, and Bach as “could be composed by a computer, like painting by numbers”, Ah, the stupid arrogance of teenagers. Anyhow, back to Bruckner. I still like him, even if I listen to his works only occasionally. Günter Wand is one of those amazingly underrated conductors, and usually only well known by die-hard Bruckner fans. 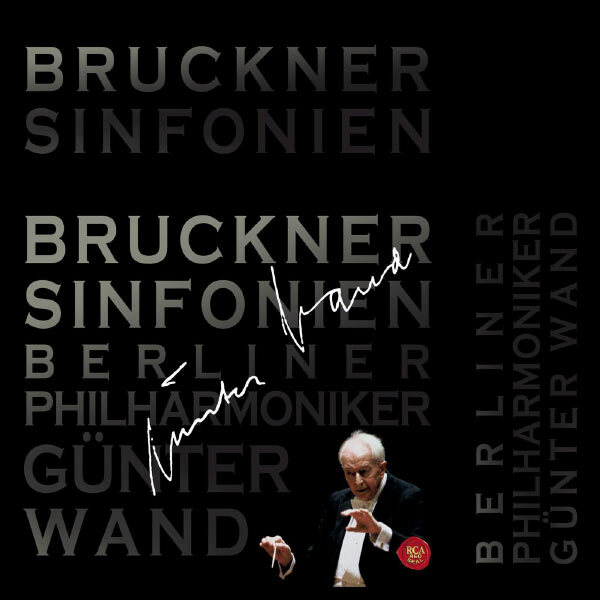 There is something special about Wand and Bruckner. To be fair, Wand has recorded the symphonies at least 3 times, from a very good cycle in Cologne in the seventies, to several recordings with the NDR Symphony Orchestra in Hamburg he lead for many years, to this one, where he got to lead the BPO for a selection of the symphonies. I grew up on Wand’ reading with the NDR. I even had the pleasure of hearing him live twice, with Bruckner 4 and 8. So obviously I’m biased, and you should certainly also check out other Bruckner specialists like Eugen Jochum or good old Karajan (yes, you Karajan haters out there, his Bruckner is great. Mind you, I used to be a Karajan hater as well….). I only got introduced to this set 3-4 years ago from a good friend of mine from high school, who attended some of the Wand concert with me. A I had kind of moved on from Bruckner, I simply stuck to my old CDs whenever I wanted to go back and hadn’t really looked in to new recordings for nearly 20 years. So what do I like about this? Well, it’ best of two worlds, you get Günter Wand who knows Bruckner inside out, and really has a lot of insights to offer, and you get a world-class orchestra like the Berlin Philharmonic. The sound of the BPO is just perfect for Bruckner. As much as I like the NDR, they are obviously in a different league. Wand approaches the symphonies in a very clean way: there is no romantic overload, no sweet sugary drama, just illustrating the actually rather introvert struggle of an underrated, very catholic Austrian organ player with an inferiority complex that Anton Bruckner apparently was for most of his life. (Bruckner experts, if I painted a wrong portrait taken mainly from reading too many booklets, please correct me!). My rating: 5 stars (I notice I’m giving too many five stars recently. But I still think this is purely due to selection bias of me wanting to write about music I really like and not some kind of star inflation). You can get it here (Qobuz). P.S. David Hurvitz disagrees with me and thinks Wand’s Hamburg recordings are superior to the BPO ones. You may want to check them out too if you find them, e.g. in this really cheap box set. You never know, I may eventually return to my “roots” as well. UPDATE Jan 29, 2016: In the Feb 2016 issue of Classica magazine, the reviewers compared blindly ten selected versions of Bruckner’s 9th. Günter Wand’s BPO version comes out on top! Here’s the comment: “The best possible version for discovering this work. Pure music, marked by the seal of infinity and eternity” (French sometimes have a certain way of getting very poetic with their language).